AM1 Molecular Modeling has been used in the comparison of Lewis acid strength of Boron Trihalide using available opportunities in this method such as HOMO-LUMO gap , infrared frequencies and molecular geometry. HOMO-LUMO separation was employed to evaluate acid strength of BX3, and results show that BI3 is more acidic than others and acidity has decreased up to halogen group. When complex formation between BX3 and dimethylamine was made , N—H bond stretching alters to red shift ( lower frequency) .It was found that I3BNH(CH3)2 has the lowest frequency for this bond .Geometry for these complexes , B—N bond length and degree of X-B-X angle of all mentioned complexes were also studied and pyramidal structure for complexed BX3 were observed. استخدمت تقنية الحسابات الجزيئية (Molecular Modeling) وتحديدا طريقة AM1 في دراسة المقارنة بين مجموعة هاليدات البورون الموصوفة بأنها أحماض لويس لتعيين درجة قوتها باستخدام الإمكانات المتاحة في هذا البرنامج مثل الفرق بين HOMO-LUMO ، ترددات الاهتزاز والشكل الهندسي . استخدم الفرق بين HOMO-LUMO لتقييم طبيعة التدرج في قوة الحوامض من صنف BX3 وقد بينت النتائج ان BI3 يمتلك قيمة الحد الادنى من هذا الفرق وهذا يعني انه الأكثر فعالية (الحامض الأقوى) من بين مجموعة الأصناف الحامضية المدروسة وان قوتها تقل صعودا باتجاه اعلى مجموعة الهالوجينات . و فيما يخص قيم ترددات الاهتزاز ، فان تشكل معقدات بين ثنائي مثيل أمين و ثلاثي هاليد البورون أفضى حسب نتائج البحث الى نقصان في قيمة تردد الاصـرة N--H ، اذ بينت النتائج ان أوطأ قيمة لهذه الترددات كانت للمعقد I3BNH(CH3)2 ، واخيرا وفيما يخص الشكل الهندسي ، فقد تم دراسة اطوال الاواصر B—N لهذه المعقدات وكذلك الزوايا X—B—X و X-B-N ولوحظ من هذه القيم ان معقدات BX3 قد تحولت من المثلث المستوي الى الهرمي . In this study we synthesized the new compounds containing bis-1,3,4-thiadiazole 3(A-D)n through many eaction steps (cyclization, diazotiazation and etherification respectively). The compounds have been characterized by melting point, FTIR and 1HNMR data. All the synthesized compounds have been evaluated in vitro for their antimicrobial activities against several microbes like: Escherichia coli, Klebsiellia pneumonia, Pseudomonas aerugenosa, Serratia marscens and Staphylococcus aureus and the results showed that some of these compounds have very good antibacterial activity. تم في هذه الدراسة تحضير مشتقات جديدة تحتوي على حلقتين من 4,3,1-ثايادايازول (3A-D)n وذلك بتطبيق عدة تفاعلات تضمنت ( تفاعلات الغلق , تفاعلات تحضير املاح الدايازونيوم وتفاعلات الايثرة على التوالي ) . جميع المركبات شخصت بواسطة درجات انصهارها وطيف الاشعة تحت الحمراء FTIR وطيف الرنين النووي المغناطيسـي 1HNMR . فحصت الفعالية البايولوجيــة لجميع هذه المركبــات خارج الجســم تجاه بعض انواع من البكتريــا مثـل Escherichia coli, Klebsiellia pneumonia, Pseudomonas aerugenosa, Serratia marscens and Staphylococcus aureus ووجد بان لهذه المركبات فعالية بايولوجية جيدة. The present study included the effect concentrations of mercury element (0.05-0.2) mg/l on algae Chlorella vulgaris. The data showed decrease cells number, growth rate and increase inhibition rate with increasing mercury concentration and the elongate of exposure period which showed the toxicity of the element. Also the results showed the toxic effect of mercury at concentrations (0.01-0.05) mg/l on the animal Simocephalus vetulus, by decreasing the longevity rate, growth rate, fecundity, fertility, number of brood per female during 21 days compared to the control.تضمنت الدراسة الحالية تأثير تراكيز من عنصر الزئبق (0.05 - 0.2) ملغم/لتر في طحلب Chlorella vulgaris وقد أدت هذه التراكيز الى نقصان عدد الخلايا، معدل النمو وزيادة معدلات التثبيط مع زيادة تركيز الزئبق وطول مدة التعرض دلالة على سمية العنصر، ايضا بينت النتائج التأثير السمي للعنصر على الحيوان القشري Simocephalus vetulus عند التراكيز (0.01 -0.05) ملغم/لتر وذلك بنقصان معدلات البقاء والنمو والخصوبة ومتوسط عدد الحضنات / الانثى مقارنة بمعاملة السيطرة. 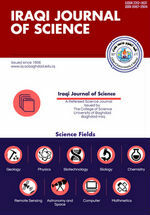 The degree of genetic divergence was estimated in six Iraqi soft wheat genotypes, four exotic genotypes, one produced by hybridization and one produced by gamma irradiation, through random amplified polymorphic DNA methodology. A total of 42 DNA fragments were generated by the 3 random primers, with an average of about 7.4 bands per primer. The 42 fragments showed polymorphism among the six wheat genotypes. Jaccard similarity matrix ranged from 25 to 66.7%, which indicated a high genetic diversity among the genotypes. We conclude that random amplified polymorphic DNA analysis can be used for the characterization and grouping of wheat genotypes; these results will be helpful in our wheat breeding program. Carbohydrates (polysaccharides ) were extracted from Saccharomyces cerevisiae cell wall by hot alkaline solution, the polysaccharides concentration was 96 mg /ml , while protein concentration was 500 µg /ml ,then primary purification method was done to separated carbohydrates from other protein materials, at this time , carbohydrates concentration was 250 mg /ml, while protein concentration was 148 µg /ml .Then partial purification using Ion exchange technique was done, and the results revealed ,four peaks were separated ,every peak was collected ,dialysed , and measured the carbohydrates concentration which were 300, 50, 33.4 and 32 mg/ml respectively, while Lawery method did not detect any protein materials in samples. The four peaks were examined as immunomodulator through the animal (mice) that were divided into 4 groups which depend upon the peaks series, were injected intraperitoneal and orally administration with constant concentration 500 µg /ml twice, then read the blood picture for immune cells, the second group was reported a significant increasing in all cells which are (2.968 ± 0.316 ), (1.56± 0.3), (0.546 ± 0.291) Lymphocyte, Granulocytes and monocyte respectively while the cell percentage for first, third, and fourth peaks were for lymphocyte (2.292 ± 0.3) ,(1.83 ± 0.32 (and )2.67± 0.5) respectively, for Granulocytes (0.83 ±0.23) ،(0.53 ± 0.22) and (0.6 ± 0.35 (respectively, while for Monocytes (0.3 ± 0.19) ،(0.03± 0.01) and (0.3 ±0.02) respectively when compared with control group. Organs crossly examination was showed hypertrophy of liver and spleen, while microscopically, there were infiltration of lymphocytes around the blood vessels in liver, lung, and peritonea, and in white pulp of spleen.استخلصت المواد الكاربوهيدراتية (متعدد السكريد) من جدار خميرة الخبز Saccharomyces cerevisiae باستعمال المحلول القاعدي الساخن، وكانت نسبة المواد الكاربوهيدراتي 96 مليغرام /مل، في حين بلغت نسبة المواد البروتينية 500 مايكرو غرام /مل، تم إجراء عملية تنقية أولية لفصل المواد الكاربوهيدراتية عن ما موجود من مواد بروتينية مرافقه وكانت قيمة تركيز المواد الكاربوهيدراتية 250 مليغرام / مل، في حين بلغت نسبة المواد البروتينية 148 مايكروغرام /مل. ومن ثم أجريت عملية التنقية الجزيئية للمواد الكاروهيدراتية باستعمال تقنية التبادل الأيوني (DEAE) وأظهرت النتائج انفصال ناتج الاستخلاص الى اربع قمم شكلت أول قمة أعلى تركيز، ثم جمعت القمم وأجريت لها عملية ديلزة وقيس تركيز المواد الكاربوهيدراتية فكان 300، 50، 33.4، 32 مليغرام /مل على التوالي، في حين لم تعطي طريقة لوري مؤشر عن وجود مواد بروتيني، اختبرت القمم الأربعة كمواد مطورة مناعيا من خلال حقن حيوانات التجربة (الفئران) والتي قسمت إلى أربع مجاميع وفق ترتيب القمم بتركيز ثابت من المستخلص والبالغ 500 مايكروغرام /مل ولمرتين، ومن ثم قراءة الصورة الدموية للخلايا المناعية، إذ سجلت المجموعة الأولى زيادة معنوية في نسبة الخلايا اللمفاوية والحبيبية وأحادية النواة إذ بلغت، ( 2.968 ±0.316 )، ( 1.56±0.3) و(0.546 ± 0.29) خلية/ سم3 على التوالي، في حين بلغت نسبة الخلايا اللمفاوية للمجاميع الأولى والثالثة والرابعة (2.292 ± 0.3), (1.83 ± 0.32) و(2.67 ± 0.5) خلية/ سم3، وللخلايا الحبيبية (0.83 ±0.23)، (0.53 ± 0.22) و(0.6 ± 0.35) خلية/ سم3 وللخلايا أحادية النواة (0.3 ± 0.19)، (0.03± 0.01 ) و(0.3 ±0.02) خلية/ سم3 على التوالي بالمقارنة بمجموعة السيطرة. الفحص العضوي اظهر حصول تضخم في الكبد والطحال ومجهريا حصول ارتشاح للخلايا اللمفاوية حول الأوعية الدموية في كل من الكبد والرئة والبريتون، واللب الأبيض في الطحال. The distortion, which occurs to the image often affects the existing amount of information, weakens its sharpness and decreases its contrast and thus leads to overlap the details of various regions and decrease image resolution. White test images are used to determine the image quality and reveal the analysis ability of different visual systems where we depended in our study on white test images, studying distribution of the light intensity of the image and figure out the relationship between the average and the standard deviation to the picture to study the optical intensity function by using the test image and the result to restrict the efficiency of the optical system. The technological results of contrast calculate are near to other different RGB colour band and gave more precise measurement in evaluating the quality as a function of the light intensity . ان التشوه الذي يصيب الصورة غالبا ما يؤثر في كم المعلومات الموجودة فيها ويضعف من حدتها ويقلل تباينها وبالتالي يؤدي الى تداخل التفاصيل للمناطق المختلفة وتقل وضوحية الصورة . تستخدم الصور الاختبارية لتحديد جودة الصورة وكشف قدرة التحليل للأنظمة البصرية المختلفة حيث اعتمدنا في دراستنا صور اختبارية بيضاء A4. لذا توجهنا في بحثنا الى دراسة تأثر الصور الاختبارية بعمليات الإضاءة المختلفة في الشـــــــدة باستخـــــــدام مصادر إضاءة مختلفة ( مصباح الفلورسنت ) . حيث تم دراسة توزيع شدة الإضاءة على الصورة ومعرفة العلاقة بين المعدل والأنحراف المعياري للصورة لدراسة معدل التباين كدالة لشدة الإضاءة باستخدام الصورة الاختبارية. واعتمدت نتائج هذه الدراسة في تحديد كفاءة الإضاءة و كفاءة منظومات التصوير. ، اما نتائج تقنيات حساب التباين المقترحة كانت متقاربة للحزم اللونية المختلفة RGB و اعطت مقياس اكثر دقة في تقييم جودة الصورة كدالة لشدة الاضاءة . Different transition rates of the nuclear preequilibrium states in the exciton model were numerically calculated in the present work, as well as the state density and matrix element of the nuclear interaction. The calculations were based on the two-component version of the exciton model. Some comparisons were made with earlier calculations, and the results showed a good agreement. The results were explained on the bases of the effects of the differences in the particle and hole numbers, as well as the type of the incident particle and its energy. The conclusions indicated that preequilibrium nuclear reactions induced by protons differ only by small fraction from those induced by neurons at low exciton states. At higher exciton states with n>3, the transitions of the types and differed significantly between neutron and proton transitions, which may indicate distinguishable nuclear reaction mechanisms. في البحث الحالي، حسبت معدلات الانتقال للحالات قبل المتوازنة في التفاعلات النووية، وكذلك كثافة الحالات النووية المتهيجة وعنصر مصفوفة التفاعل النووي. النظام المستخدم مبني على الحالة ثنائية المركّبات لأنموذج الجسيمة المهيجة. أجريت بعض المقارنات مع حسابات سابقة وأوضحت النتائج تطابقا جيدا. فسرت النتائج على أساس الفروق في التوزيع العددي للجسيمة والفجوة وتأثيرها مع تأثير نوع الجسيمة الساقطة وطاقتها. تم الاستنتاج بأن التفاعلات النووية للحالة قبل المتوازنة المحتثة بالبروتون لا تختلف سوى بجزء بسيط عن تلك التفاعلات المحتثة بالنيوترون عند حالات التهيج ذات الأعداد الواطئة. عند n>3، ظهر فرق واضح خصوصا بين معدلي الانتقال و مما يشير إلى تمايز ميكانيكية التفاعل النووي عند هذه المستويات. The work is a method of an improving "Qaiyara" crude oil recovery using a mixture of hot water with surfactant. Laboratory system was designed. Using this system, four tests of hot water with surfactant under various condition were conducted. The first three tests are conducted under temperatures 50, 60, 80oC respectively with mixture of hot water + 2% wt. surfactant. The fourth test is done under 80oC and mixture of hot water +4% surf. The result obtained show the efficiency of hot water with surfactant in improving the recovery. The results show proportioned relation between temperature and surfactant concentration with oil recovery. تضمن البحث طريقة لتحسين إنتاجية نفط حقل الكيارة الذي يعتبر من الحقول المنتجة للنفوط الثقيلة، إذ تراوحت كميات الإنتاج حسب التقارير ما بين 300-1178bbl/D في السنتين الأخيرة. استخدم في هذا البحث خليط الماء الحار مع أحد أنواع مركبات الشد السطحي المعروف باسم (الزاهي). تم إعداد منظومة مختبرية لإجراء التجارب. أجريت فيها أربعة اختبارات الثلاثة الأولى تحت درجة حرارة 50، 60، 80 مئوية مع مركب الزاهي بتركيز 2% وزنية، أما الاختبار الرابع فقد استخدم فيه ماء بدرجة حرارة 80 مئوية مع مركب الزاهي بتركيز 4% وكانت النتائج مشجعة من خلال وجود علاقة طردية ما بين كمية الإنتاج والظروف المطبقة. ظاهرة الزحف لنهر دجلة وعلاقتها بالتكسية الحجرية في مدينة بغداد. Tigris River meanders in Baghdad in several areas. Al-Jadiriyah, Al-Kadimia and Al-Atafia are the most important meander that meanders sharp and distinctive with sinuosity reach 4.1, 2 and 1.5 respectively Maps, aerial photographs and satellite images have been used, also surveyed field study, and by matching these maps, reflect and show the increased distortions intensity and slowly in the first half of the last century because of the impact of repeated high discharges and for the erosion in the concave side and the process of deposition in the convex side. After the middle of last century high discharges decreased due to the construction of dams and hence the lower the activity of the river and stopped the river migration and confined within the boundaries of the river downstream. The deposits of the study area represented by Holocene deposits of sand, silt and clay. The nature of the energy of deposition is determined by the river where the sand deposited first at the bottom of the river bed, which represents the beginning of the sediment cycle, the more fine grains to the top phenomenon fining upwards, a phenomenon characteristic of the fluvial meandering environments. The stone walls made on the banks of the Tigris River within the city of Baghdad, the work of the cladding stone to the sides of the river and did not reached the bottom of the river making it easier to erosion of coarse river deposits, and thus the collapse of cladding with stone usually sites, thereby requiring processors engineering the most important of throwing large Dolomite stones to prevent this process occurs.يلتوي نهر دجلة في مدينة بغداد في عدة مناطق أهمها التواء الجادرية الذي يلتوي بشكل حاد ومميز وبمقدار تعرج 4.1 ويليه التواء الكاظمية بمقدار2 والتواء العطيفية بمقدار 1.5. استخدمت الخرائط القديمة والحديثة المدعومة بالصور الجوية والمرئيات الفضائية أيضاً وكذلك تم عمل مسح أرضي ميداني، ومن خلال مطابقة تلك الخرائط نلاحظ ازدياد الإلتواءات شدة وبصورة بطيئة في النصف الأول من القرن الماضي بسبب تأثير تكرار ارتفاع التصاريف وحصول عملية الحت في الجانب المقعر وعملية الترسيب في الجانب المحدب. فبعد منتصف القرن الماضي قلت التصاريف العالية بسبب بناء السدود والخزانات وبالتالي قل نشاط النهر وتوقفت عملية الزحف النهري واقتصرت عملية الزحف النهري داخل حدود مجرى النهر. تمثل رواسب منطقة الدراسة رواسب حديثة متمثلة بالرمل والغرين والطين. إن طبيعة الترسيب تتحدد بالطاقة النهرية حيث الرمال أولاً في أسفل قاع النهر والتي تمثل بداية الدورة الرسوبية، وتزداد النعومة إلى الأعلى مكونة ظاهرة التناعم إلى الأعلى، وهي ظاهرة مميزة للبيئة النهرية الالتوائية. أمتاز مشروع تهذيب ضفاف نهر دجلة داخل مدينة بغداد بعمل تكسيه حجرية لجوانب النهر فقط دون قيعانه مما يسهل عملية حدوث نحر سفلي للرواسب الخشنة أسفل التكسية وبالتالي انهيار التكسية الحجرية في عدة مواقع، مما يستدعي وضع معالجات هندسية أهمها رمي أحجار دولومايت كبيرة لمنع حدوث هذه العملية. In this paper, we introduce and study new types of separation axioms in tri-topological spaces, where we defined it using new types of closed set but not necessarily closed sets. Several properties of these concepts are proved.في هذه الورقةِ، نُقدّمُ ونَدْرسُ أنواعَ جديدةَ مِنْ بديهياتِ الفصل في الفضاءات التبولوجية الثلاثية، حيث عرّفنَاه بإستعمال أنواعَ جديدةَ مِنْ المجموعةِ المُغلقةِ لكن لَيستْ مجموعاتَ مُغلقةَ بالضرورة. كما سنثبت مجموعة من القضايا المقترحة على تلك المفاهيم. In this paper we will introduce the concept of (, ) reverse derivation, generalized (, ) reverse derivation and generalized left (, ) derivation. Let R be a 2-torsion free prime ring and U a Lie ideal of R such that u2U, for all uU. The main result of this paper states that if F is a generalized (, ) reverse derivation on R which also acts as a homomorphism or as anti- homomorphism on U, then either d=0 or UZ(R) Further, as an application of this result it is shown that, if every generalized left (, ) derivation on R which also acts as a homomorphism or as anti- homomorphism on U, then either d=0 or UZ(R). في هذا البحث سنقدم مفهوم كل من مشتقة(, ) المعكوسه، تعميم مشتقة(, ) المعكوسه وكذلك تعميم مشتقة(, ) اليسرى. لتكن R حلقة اوليه طليقة الالتواء من النمط 2 و Uمثالي لي بحيث u2Uكل uU. الهدف الرئيسي لبحثنا هو اذاكانتF هي تعميم مشتقة (, ) المعكوسه على R بحيث تكون تشاكل او تشاكل ضد على U فاما d=0 او UZ(R).بالاضافه الى ذلك، كتطبيق على هذه النتيجه برهنا كل تعميم مشتقة(, ) على R بحيث تكون تشاكل او تشاكل ضد فاماd=0 او UZ(R). A watermarking scheme based on slantlet transform, an orthogonal discrete wavelet transform with two zero moments and with improved time localization, is presented in this paper. The watermark is embedded into mid band frequencies of slantlet coefficients in the transform domain, which leads to very small distortion and guarantees the visual quality of the watermarked image. The performance of the proposed algorithm is compared with embedding watermarking system using wavelet transformation the result show promising performance of the proposed system where the increasing in PSNR is approximately 20 dB. العلامة المائية المعتمدة على التحويلات من نوع مويلة (slantlet)، تحويلة المويل تعتبر تحويلة مويجة متعامدة مع تحسين في تمركز الوقت. العلامة المائية يتم حشرها ضمن الحزمة الوسطية لترددات معاملات المويل والتي تقودنا الى تشويهات صغيرة جدا وتضمن جودة بصرية عالية للصورة ذات العلامة المائية. أداء الخوارزمية المقترحة تم مقارنته مع نظام العلامة المائية باستخدام المويجة (wavelet) والنتائج اظهرت اداء واعد للخوارزمية المقترحة بفارق((20dB. Discrete Slantlet Transform (DST) --- watermarking --- copywriting protection. Stream cipher system plays an important role in many practical encryption systems. Moreover it can be an ideal source in random number generation. Shift registers are the backbone of such systems. This paper presents a method for attacking and recovering the basic key for the general stream cipher systems. Different criteria should be studied carefully when a key stream generated via these systems. Depending on the type of feedback connection of different stages, the output stream may be classified as linear and nonlinear. Different parameters specify complexity degree of the output of these systems. Proposed system achieved to recover the initial cipher key via two modules. The First module focuses on simulating some general stream cipher systems including shift registers with different lengths, while the second recovers the basic or the initial key which is generated from the first module. Recovering key attached by normalizing polynomial equations to set of linear equations. Nonlinearity output normalized to linear equation before recovering the key. The proposed technique overcomes the complexity parameter of linear and nonlinear stream sequence compared with other techniques in this field. C++ version 4.5 where used in implementing the proposed system. تلعب أنظمة التشفير المستمر دورا" مهما" في معظم أنظمة التشفير العملية. بالأضافة الى ذلك يمكن أن تكون تلك الأنظمة مصدرا" مثاليا" في أنظمة توليد الأرقام العشوائية. تعتبر مسجلات الأزاحة العمود الفقري لتلك الأنظمة. هذا البحث يقدم طريقة جديدة لمهاجمة وأستعادة المفتاح الأساسي لأنظمة التشفير المستمر العامة. يجب دراسة كيفية توليد مفتاح التشفير عند بناء تلك الأنظمة. بالأعتماد على نوع الربط ين أجزاء مسجل الأزاحة ,فأن مخرجات هذا النظام يمكن أن تصنف الى خطية والى لاخطية. هناك عدة معايير تحدد درة تعقيد مخرجات هذا النظام. ينجز النظام المقترح في أستعادة المفتاح الأبتدائي من خلال جزئين أو وحدتين. الأول يركز على تمثيل بعض أنظمة التشفير المتضمنة مسجلات أزاحة مختلفة الأطوال, بينما الجزء الثاني يعمل على أستعادة المفتاح الأبتدائي الذي تم توليده في الجزء الأول. أن هذه الأستعادة تمت من خلال تبني طريقة رياضية جديدة وهي طريقة حل المعادلات الخطية بأستخدام طريقة كاوس أو أيجاد معكوس المصفوفة. أن النظام المقترح قد تغلب على درجة التعقيد لأنظمة التشفير المستمر الخطية واللاخطية مقارنة مع التقنيات الأخرى المستخدمة في هذا المجال. أستخدمت لغة C++ نسخة 4.5. Computer simulation have been developed to calculate the dates, ecliptical, equatorial and horizontal coordinates every month at al Najaf holy city. The new moon starts at the moment when the ecliptic longitude of the sun matches that of the moon, i.e., the difference between them vanishes. The program can be used to predict the birth dates of the moon for the next ten year or more. تم في هذا البحث تطوير برنامج حاسوبي لحساب تواريخ ولادة القمر الجديد في كل شهر وموقعه نسبة للإحداثيات البروجية فضلا عن الإحداثيات الاستوائية والافقيه لمدينة النجف الاشرف. حيث يحدد تاريخ ولادة القمر في أي لحظه عند حصول توافق بين خط الطول البروجي لكل من القمر والشمس اى عند تلاشي الفرق بينهما. وقد تمكنا من توقع ولادة القمر لعشر سنين قادمة بدقة عالية. The motivation we address in this paper is to find out a generic method used to segment and classify different types of conceptual images. A novel median based method was proposed as primary stage for image segmentation, in which the image is partitioned into fixed sized quadrants called kernels. The size of kernels in a specific image is determined according to the spectral uniformity measurements. Later, Ant Colony Optimization (ACO) is used to find out the optimal number of classes may exist in the image, and then classify the image in terms of the determined classes. Different types of images with different semantic concepts were used to test the proposed classification method. The results obtained by ACP ensure the success of the proposed method and the effective performance of classification.ان الهدف من هذا البحث هو ايجاد طريقة لتجزئة وتصنيف الصور بحيث تكون شاملة لجميع انواع الصور بمختلف مفاهيمها التعبيرية. ولذلك تم اقتراح طريقة جديدة مبنية على حسابات الوسيط كمرحلة اولية لتصنيف الصور، وفيها تُجزأ الصورة الى بلوكات منتظمة الحجم. ان حجم البلوكات في صورة معينة يُحدد طبقاً الى مقاييس الانتظامية الطيفية. بعد ذلك اٌستخدمت خوارزمية مستعمرة النمل (ACO) لايجاد عدد الاصناف الامثل للصورة. ومن ثُم صنفت الصورة بدلالة الاصناف المُحددة. ولأجل اختبار طريقة التصنيف المقترحة، أُستخدٍمت صور ذات مفاهيم وصفية مختلفة. كانت نتائج التصنيف المستحصلة بواسطة طريقة مستعمرة النمل (ACO) واقعية وهي تؤكد نجاح الطريقة المعتمدة وكفاءة اداء عملية التصنيف. Interleukin-1α( IL-1α) and interleukin 8 (IL-8) have a major role in initiation of immune response. These two cytokines are secreted mainly by monocyte. This study aimed to evaluate the initiation of immune response in patients with acute lymphoblastic leukemia. Blood samples were collected from 36 patients with ALL (26 treated and 10 untreated ). Other 10 blood samples were collected from healthy individuals as control group. Enzyme linked immunosorbent assay (ELISA) was used to estimate serum concentration of IL-1 and IL-8. Absolute monocyte count in each blood sample was determined. The study showed a significant decrease in serum concentration of IL-1α in treated and untreated patients, whereas, serum concentration of IL-8 and blood absolute monocyte count showed significant increase in untreated patients. Dropping in IL-1α and elevation of IL-8 with increasing absolute monocyte count may indicate suppression of gene expression for IL-1 but not for IL-8.كل من بين ابيضاض 1 ألفا وبين ابيضاض 8 دور أساسي في المراحل الأولية للاستجابة المناعية ، ويفرز كلا من هذين المحركين الخلويين بشكل رئيسي من الخلايا الوحيدة . استهدفت الدراسة تقييم المراحل الأولية للاستجابة المناعية في مرضى ابيضاض الدم اللمفي الحاد . جمعت عينات دم من 36 مريضا بابيضاض الدم اللمفي الحاد ( 26 معالجون و 10 غير معالجين ) بالإضافة إلى 10 عينات من أشخاص أصحاء مثلوا مجموعة سيطرة . استخدمت تقنية الاليزا لتقدير التراكيز المصلية لبين ابيضاض 1 و 8 وتم حساب العدد المطلق للخلايا الوحيدة في كل عينة دم .أظهرت النتائج انخفاضا معنويا في التراكيز المصلية لبين ابيضاض 1 ألفا في المرضى المعالجين وغير المعالجين فيما أظهرت التراكيز المصلية لبين ابيضاض 8 والعدد المطلق للخلايا الوحيدة ارتفاعا معنويا في المرضى غير المعالجين . إن انخفاض تراكيز بين ابيضاض 1 ألفا وارتفاع تراكيز بين ابيضاض 8 مع زيادة العدد المطلق للخلايا الوحيدة ربما يشير إلى تثبيط التعبير الجيني لبين ابيضاض 1 ألفا وليس بين ابيضاض 8 . The aim of this study was to estimate the rate of infection with Paramphistomum in the digestive tract of cows. A total of 268 slaughter cows were examined in Al-Hilla Abattoir from 1 March to the end of November 2009. The rate of infection was 3.73% and the highest rate of infection was at summer months (6.45%) while lower infection rate was shown at Autumn (1. 2%). Rate of infection in calves at age less than 2 years reached 3.44% and in cows at age between 2-4 years reached 4.23 %. Lower percentage at age more than 4 years was reported (3.17%) Males cows recorded rate of infection with Paramphistomum 4.76% and in females cows reached 2.47%, while the infection rate in hybrid cows was more than the local cows (4.87% and 2.75% respectively). Pathological changes at necropsy finding showed slight changes with high numbers of parasites in the lumen of rumen attached to the mucosa of rumen at the keratinized layer. In addition, changes were noted at microscopical examination, which were characterized by infiltration of mononuclear cells in lamina propria for the mucosa and there was dilation of blood vessels. No changes observed in duodenum and jejunum with no presence for immature parasite which gave an indication that most of the infection was with the mature stage.هدف البحث الحالي للتحري عن اصابة القناة الهضمية للابقار بديدان Paramphistomum cervi فحص 268 عجل وبقرة مذبوحة في مجزرة الحلة الرئيسية للفترة من الأول من آذار2009 لغاية نهاية تشرين الثاني 2009. بلغت نسبة الإصابة الكلية بديدان Paramphistomum 3.73 % وكانت أعلى نسبة للإصابة خلال أشهر الصيف (6.45 %) وأوطأها خلال أشهر الخريف (1.2 %). كانت نسبة الإصابة في العجول بعمر اصغر من 2 سنة 3.44% وبلغت في الأبقار بعمرسنتين إلى أربع سنوات 4.23% وسجلت أوطأ نسبة في الأبقار بعمر اكبر من 4 سنوات (3.17%). سجلت الذكور تفوقا في نسبة الإصابة وبنسبة 4.76% وفي الإناث كانت النسبة 2.47 %. كانت نسبة الإصابة في السلالات المضربة أعلى من المحلية حيث بلغت 4.87 %و2.75% على التوالي. اظهر الفحص المرضي العياني للكرش تغيرات مرضية طفيفة مع وجود اعداد كبيرة من الطفيلي ملتصقة في مخاطية الكرش عند طبقة سميكة من القرنين. كما لوحظ من خلال الفحص المرضي النسجي وجود ارتشاحات للخلايا وحيدة النواة في الصفيحة الاساسية للمخاطية مع توسع الاوعية الدموية. لم تظهر الامعاء أي تغيرات مرضية عيانية او مجهرية سواء للاثني عشري او الصائم كذلك لم يلاحظ وجود للطفيلي غير البالغ هناك مما يدل على ان معظم الاصابات التي وجدت كانت عند الطور البالغ.